Launch behind you: Tap at the bottom part of the screen. Launch ahead of you: Tap at the top part of the screen. A down arrow under a Bonus means that you can launch it behind you! Remember to adjust the sensitivity 0? the controls in the options menu! Hold the skid then release the button. The longer your skids, the more powerful the mini-turbo is! Three Puzzle Pieces are hidden in each "Puzzle Piece" challenge! It 's up to you to find them! Win the challenges to unlock new objects in the store! Make good Combos and become even better! You can improve your bonuses even more by putting the right hat on the right character! Boosts give you a slight advantage over your competitors! Before a race or challenge, choose the right Boost! It can heip you win! This delicious Pie ﬂies straight $or*war-d and knocks down any Kart it hits! A GPS was added to the recipe! You can aim this Pie at the Kart Just ahead! Your Kart is protected in the air with this Spring! Use it to take shortcuts or avoid obstacles! Lasagna gives you the energy to go Faster and overtake your opponents! Its smell is so gorgeous that it protects you from attacks. With a dirty hat and its repuisive smell, you can Knock down your competitors! Abracadabra, aim at a Kart and teleport to its position! The U.F.O.s emit 3 weird rays onto the track, Just ahead of the kart in first position: two are traps...only one is friend|y! All your competitors are suddenly struck down with the need to sleep. Good night! You can get free stuffs in Garfield Kart Fast & Furry app by logging in daily. You can get this cheat by changing your phone's time setting. Close your Garfield Kart Fast & Furry app by either restarting your phone or by killing it on your task manager. Open Garfield Kart Fast & Furry app and you will get your daily rewards. Open Garfield Kart Fast & Furry app but do not play a single game. 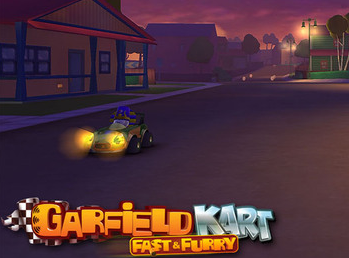 Open Garfield Kart Fast & Furry app just to make sure that there is no problem.